The SAS Gallery at St. Andrew's-Sewanee School in Sewanee, Tennessee, has opened its 2018-19 gallery season with a collection of charcoal drawings by Tara Shukla that gallery director Julie Jones describes as "sublime [and] highly detailed." › When: Through Friday, Sept. 21. Reception, 3-6 p.m. CDT Thursday, Aug. 30. Gallery open 9 a.m.-3 p.m. Monday-Friday and by appointment. › Where: SAS Gallery at St. Andrew’s-Sewanee School, 290 Quintard Road, Sewanee, Tenn. They are drawings of bones. In "Shukla's Bone Drawings," the artist offers not some macabre scene of skeletal remains — though, in the strictest sense, they are that. No, as Jones describes, these are sublime renderings that could just as easily illustrate an art book as a medical journal. These recent drawings are based on specimens Shukla borrowed from the Grinnell College Biology Department and are inspired by traditions of trompe l'oeil painting, natural history and scientific illustration. "Like those forms of imagery, bones are a kind of permanent record — they last beyond death — and symbolize underlying truth," says Shukla. Shukla's work was recently part of the exhibition "Making Life Visible: Art, Biology and Visualization" at Grinnell College's Faulconer Gallery. "When I draw, I begin by observing," Shukla explains in her artist statement. "The closer I look, though, the less clear things seem. Drawing becomes a dialogue between form and process, representation and abstraction, imagined and real." Shukla says she sketched and photographed the borrowed bones to create a larger composite image. "When drawing, I am absorbed by the task of paying attention and accurately rendering forms and surfaces," she says. "Despite my care, the forms continue to elude me — they are all fragments, partial and mysterious. Sometimes they resemble other things. They evolve as objectivity gives way to the process of drawing. The drawings embody both the desire to understand, to capture truth, through slow, careful analysis and an awareness of the ultimate impossibility of this attempt." In an interview in Grinnell's student newspaper, The Scarlet & Black, writer Zoe Fruchter describes the larger-than-life works as " intricate and lifelike with delicate yet forceful detail." Shukla was born and raised in Toronto, Canada. She holds a BFA from Queen's University (Kingston, Ontario) an MFA from Concordia University (Montreal, Quebec) and a certificate in digital media from Digital Media Studios in Toronto. Her work has been featured in numerous solo and group exhibitions in Canada and the United States and is held in public and private collections in the U.S, Canada and Europe. She has taught drawing, painting, graphic design and art appreciation in art schools, museums and colleges. Shukla's work also include series of botanicals and rope drawings in charcoal on paper, as well as digital prints and oils on canvas. 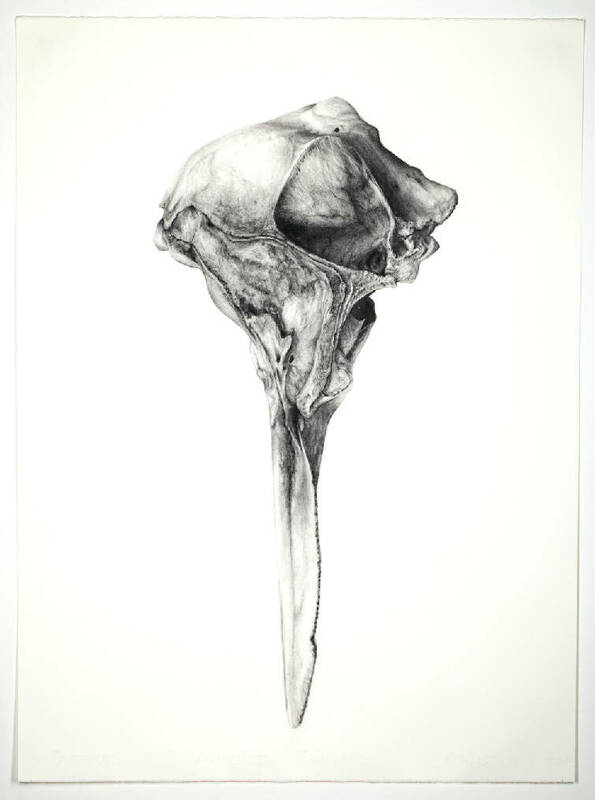 "Shukla's Bone Drawings" will be on display in the SAS Gallery through Sept. 21. A reception for the artist is scheduled Aug. 30, and Shukla will lead a public drawing workshop," Nature Close Up: Drawing Natural Forms From Observation," on Sept. 1. In conjunction with the SAS exhibit, artist Tara Shukla will offer a one-day public drawing workshop, “Nature Close Up: Drawing Natural Forms From Observation,” 9 a.m.-4 p.m. CDT Saturday, Sept. 1. The workshop will begin with exercises to develop observational skills and build to a more sustained drawing. Elements of drawing from line to form, value and texture will be explored, emphasizing the detailed charcoal technique visible in Shukla’s drawings. The workshop also will look at the work of diverse artists who have drawn and interpreted nature using a range of drawing styles from expressive to botanically accurate. For more information, contact gallery director Julie Jones at sasgallery@sasweb.org or online at www.sasweb.org (click on exhibit information under School News to find the link).